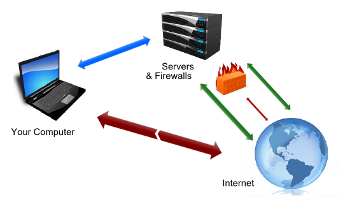 A proxy or proxy server is a server (or a computer) that allows users to tunnel their Internet actions through the proxy. This also allows your IP address to be masked and enables anonymous browsing. The process is simple: the user’s PC initializes a connection with a proxy server, sending it requests which in turn processes the requests and returns the results it received. In other words, this is as if you would be using one computer to connect to another computer to connect to the rest of the world, where all of your Internet actions performed will appear to have been done from the secondary computer. A VPN, otherwise known as a virtual private network, is a server similar to a proxy that gives users access to the Internet via a server hosted by a VPN data center. All Internet data performed on your device is tunneled through the VPN server, all of which is completely encrypted to keep away from spying eyes. To put it simply, VPNs provide an extra layer of security to your network by hiding Internet activity from ISPs, government organizations, and hackers. It can also allow users to access region-locked content and spoof your location. Remember, however, that some providers will log your actions, meaning anything that’s absolutely confidential could be seen by the government if requested. Are VPNs and Proxies Legal? Yes, VPNs and proxies are completely legal in most countries. Some countries, such as China and Iran, keep a close eye on virtual private network providers and usually restrict their citizens from using them. These countries also have network protocols in place to prevent citizens from accessing international VPNs. Believe it or not, however, citizens in censored countries like China usually find a way around this ban. In other words, the government’s stance on VPNs is somewhat loose due to how easy it is for a user to get around this block. It’s worth noting that with the rise in terror and violence around the world now relies on the use of technology, and criminals often use VPNs and proxies to hide their actions. For this reason alone, some providers are obligated to keep logs. Keep in mind that it is possible to find services who claim to wipe logs on a regular basis. While proxy servers can mask your IP and keep users anonymous, they usually don’t keep packets encrypted. In other words, hackers or network administrators won’t be able to see what you’re doing on a VPN, whereas a proxy can be more obvious. Both proxy and VPN providers may provide logs, however, so keep this in mind when searching for one. It’s also worth noting proxy servers can only be used with web traffic unless third-party clients are used to utilize the proxy with external applications. Third-party clients can be utilized to enable proxy protection via apps, but with VPNs you won’t need to take this extra step. VPNs can also be accessed via apps and other mobile devices, and some providers offer exclusive apps for their subscribers. The speed of your proxy or VPN depends on the provider and where the data centers are located. Try to test servers before buying to ensure they’re fast enough for your needs. Again, it depends on the provider. However, VPNs seem to have better overall up-time and stable network speeds. Overall, we recommend using VPN. Proxies are meant for web traffic and won’t offer the same solid features as a VPN. Many VPN providers don’t log either, so you won’t ever have to worry about getting in unnecessary trouble.